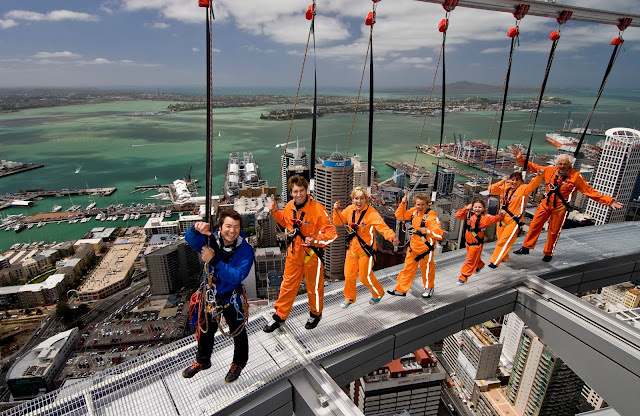 Today's initial inquiry into Saturday's incident up the Skytower has found that the Skywalk people were not at fault. An, as it turned out, mentally-disturbed man who was part of the group being escorted around the platform that rings the top managed to unhook his ropes and spent 5 hours wandering around it, dangling his legs over the void, threatening to jump and astonishing onlookers down on the closed-off streets who were probably secretly torn over what it was they wanted to see happen. They did all though have the good manners to applaud when the man was eventually persuaded by a priest to go back inside. I was surprised that he'd managed to free himself of his safety lines, since one of them is attached behind your back, and you'd need to be a bit of a contortionist to detach that carabiner. The whole preparation phase was amazingly involved and pernickety - we weren't allowed to have anything in our pockets, not even a tissue, despite wearing those unflattering orange overalls on top of everything. We were trussed up snug as a bug, and thoroughly briefed about safety, which made it all the more bizarre when the guide then encouraged us all to lean out backwards over the 192 metre drop. Of course it was safe. When I've written about doing this sort of thing before, I've put my lack of nervousness down to a total failure of imagination - but really, it's complete trust in the people in charge and systems that are in place. The guides for their part have probably had equally total trust in the self-preservation instinct of the punters. Time for them to think again, it would seem.